Most recent pay--slip and letter from employer detailing study leave arrangements (if study-leave with pay has been granted by the employer). Applying for a loan for someone? Click here for information on our Special LEARN WHILE YOU EARN LOAN. Stay at home, on the job and further your studies. To find out details on what can be used as security click here. 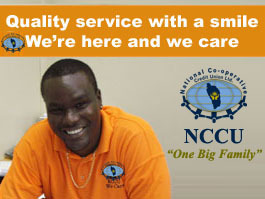 National Cooperative Credit Union Ltd.
© National Co-operative Credit Union Limited. Designed by W2beyond.